Bike-sharing (bikes as public transit!) is sweeping the world and getting scads of new people riding bikes. What could a bike share program in San Francisco look like? Come out and participate in this half-day public dialog and design charrette and help shape the future of bike sharing your city. + See, feel, touch, roll Clear Channel's bikes (the system used in Barcelona) up close and personal! ++ Hear the current thoughts on implementing bike sharing from folks at SFMTA and BART. +++ Put your heads together and dream up the perfect bike, the ideal station locations, and other future-perfect visions of bike sharing in SF. Barcelona's Bicing turned 1. Happy birthday! Or should I say, "¡Felice cumpleaños!" - Bicing has 130,000+ users from 16 - 83 years old with a majority between 26 - 35. - The system is up to 4, 300 bikes which are used an average of 30,000 times/day. - Each bike is used an average of 8 times/day. - The average trip lasts 17 minutes and covers 3 kilometers. - There are currently 286 stations that cover every district within the city limits. - About 120 workers travel around the city in special Bicing vans to make repairs, switch out damaged bicycles and provide station maintenance. - Every day about 300 new people join the system by paying the 24 euro annual membership fee. May the next year bring Bicing even greater success. 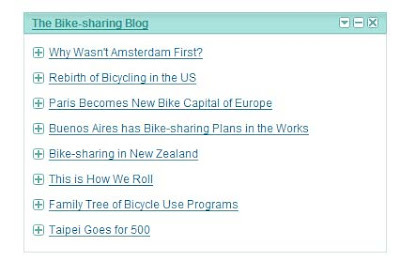 New for Earth Day, The Bike-sharing Blog now has a Google Gadget so you can keep up-to-date on what's happening with bike-sharing around the world on your Google desktop. Download the Gadget for use on your iGoogle page today. With all of the happenings of bike-sharing around the world, Amsterdam has been noticeably quiet. How could this be? Amsterdam, afterall, is one of the most bikeable cities on Earth with nearly 40% of its population using bikes daily. Wouldn't a bike-sharing program be well used there? Well, not necessarily because the residents of Amsterdam already bike. A good analogy is dropping a large stone into a small pond makes a bigger splash than a small stone into a large pond. With the former, the large stone would produce a large splash. This is what happened in Paris. The large stone in this analogy is Velib' with its 20,600 bikes and the small pond was the bike mode share in Paris before Velib' at about 1%. The relative increase of bike mode share due to Velib' has been tremendous and it has totally changed Paris's bike culture. While not near Amsterdam's 40%, Paris will likely have a significant increase of up to 10% and Velib' hasn't even been around for one year. Bike-sharing in this sense is the most significant thing a jurisdiction can do to rapidly increase bike mode share. But remember too that Paris has also spent a good sum of money creating the bike facilities that would be used by the bike-sharers, with bike lanes, cycle tracks, and bike parking. They didn't simply drop bike-sharing onto a foreign landscape only made for motor vehicles. Amsterdam's future bike-sharing program would be following the latter portion of this analogy with the small stone into a large pond as their bike mode share is already so high there that the stone would need to be even larger to attempt to create the same ripple effect. This isn't to say, however, that bike-sharing is pointless in Amsterdam. While 40% is high, it's not 50%. For a city extending itself to reach that next goal of bicycle-friendliness, getting that next 10% for Amsterdam will be much more difficult than for Paris to go from 1 to 11%. Had Velib' been launched in Amsterdam instead of Paris, I'm sure that it wouldn't have garned as much attention because the bike culture already exists. Amsterdam is in many ways beyond the need of bike-sharing for its residents because they "are unlikely to give up their own bicycle when a rental scheme is introduced," reports News from Amsterdam. However, Amsterdam is considering a high-tech 3rd generation program for other populations which include out-of-town commuters and tourists. Copenhagen realized this fact as well with its Bycyklen which has a large tourist component. Everyone should experience Amsterdam and Copenhagen as the locals do - by bike. Now the same can be true for Paris. And, regarding the title of this post, "Why Wasn't Amsterdam First?" Amsterdam actually was the first to have bike-sharing back in 1968. Of course their White Bikes didn't have smart cards and wifi of today's bike-sharing technologies, so the bikes were stolen immediately. However, Amsterdam's 2nd attempt with bike-sharing will surely go much better. Rebirth of Bicycling in the U.S.
Forty years ago at this very intersection of 14th and U Streets Northwest in Washington, D.C., riots broke out after the assassination of Dr. Martin Luther King Jr. on April 4, 1968. The commercial corridors of both streets burned for three days. This neighborhood finally has been rebuilding itself from the ashes of the riots to recapture the hope and dreams it once had. Today the U Street neighborhood is one of the hottest neighborhoods in D.C. with some of the best restaurants, bars, and entertainment the city has to offer. At this very same intersection is America's first bike-sharing station and the rebirth of bicycling in the United States. With this I hope we can rebuild American society from the auto-dominated car culture we've developed since World War II into a progressive and eco-friendly society that is transit-dominated and pedal-powered, not fossil-fuel powered. The 10 SmartBike DC racks are popping up throughout the city with a soft launch expected in April (maybe Earth Day?) and the full launch in May. The stations are not powered yet, nor are bikes available. This, and the future of bicycling in the U.S., should all change in the next few weeks. 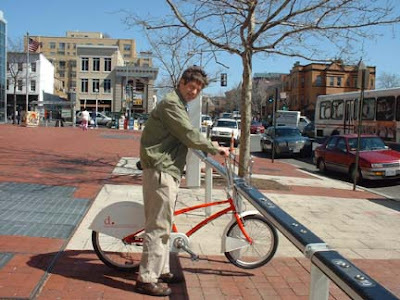 Posted by Paul DeMaio at 8:42 PM 7 comments: Labels: SmartBike DC, Washington D.C.
With the July 2007 launch of Velib’, Paris’s bike-sharing program, Socialist Mayor Bertrand Delanoë has transformed his city and how Parisians and tourists move about. With 10,500 bikes at the end of 2007, expanding to 20,600 in 2008, Delanoë has promised an even 1,000,000 bikes for 2009, an election year, to ensure his victory with the overwhelming success and popularity of the program for which he is credited. With the larger fleet of public use bicycles will come a new name of the world-class program: Velib’ meet Millib’. Already the world’s largest bike-sharing scheme, growing to a million bikes in one year will be a large task for the city and its bike-sharing vendor, JCDecaux, to complete. Finding new locations for stations will require the removal of nearly 400,000 parking spaces, or roughly three quarters of the city’s public parking, and in some cases historic buildings will need to be demolished. The dire plans for one such building has ruffled the feathers of many Parisians - this building is Notre Dame. Even with the loss of a famous structure, some Parisians, like Paul-Henri Godot, a 30-something fan of bike-sharing, believes that Velib’ can do no wrong. “Last week my wife and I were coming home from the hospital and decided instead of calling our daughter Amélie, we shall call her Amélib’,” said Godot. Their daughter is 9 years old. This level of high praise is becoming more commonplace with the naming and renaming of children in hipster neighborhoods with the words “velo” and “liberte’ ” in their more common names. Before Velib’, about 1% of trips made in Paris were done so by bicycle. This has increased to 10% by the end of 2007 and analysts predict will reach 53% once all million bike-sharing bicycles are on the street making 27.3 million trips per day. This would surely make Paris the most bike-friendly city in Europe and the world. Parisians are elated by this possibility, however, the citizens of Copenhagen and Amsterdam which are traditionally Europe’s most bike-friendly large cities are revolting. “Who does Paris think he is?,” questioned Henning Bek of Copenhagen. 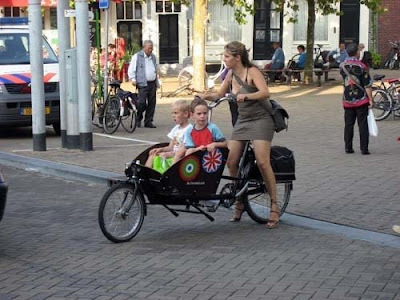 “We have fought hard for the title of Bike Capital of Europe since the 1970’s. Paris didn’t even know what a bike was a year ago, so how dare it steal the title from us!,” said Bek. Regardless whether Paris wins this new title or not, it’s April Fools Day! Enjoy! And go for a bike ride.